We can learn so much about nature and its delicate balance when we invite nature into our own backyard. Learn how to create food, shelter, and watering areas to keep many interesting and beneficial creatures close enough to watch. Enjoy this original mural painted just for the Environmental Center by local artist Ken Stetz. It captures all the natural beauty of the Manasquan Reservoir. 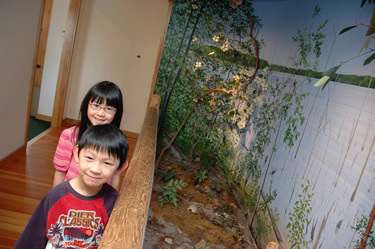 In this display, a “Day to Night” diorama depicts a scene along the Reservoir. Not all of the animals that reside at the Manasquan Reservoir can be seen during daylight hours. The animals most commonly seen are diurnal, active only during the day. Many animals are nocturnal, active only at night, or crepuscular, active only at dusk or dawn. Visitors can observe how the Reservoir looks at twilight.